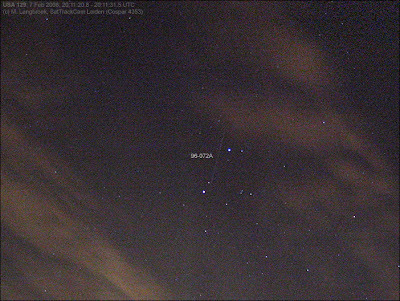 This evening was clear, albeit with occasional patches of low clouds passing. I observed the KeyHole USA 186 (05-042A) and the NOSS duo's 3-3 (05-004A & C) and 3-4 (07-027A & C). 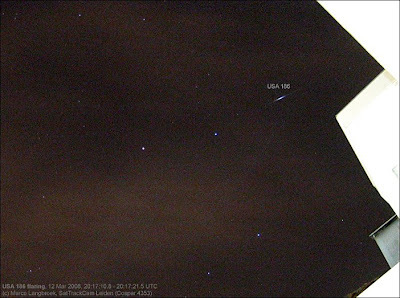 The highlight of the night were however the European cargo ship ATV-1 "Jules Verne" and the International Space Station ISS chasing each other in the sky. They made a pass at 22:12 local time (20:12 UTC) going into eclipse close to the zenith. 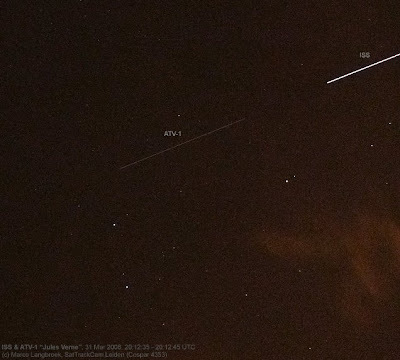 The ATV lead the ISS by about 15 seconds in time. It was about mag. +1, while the ISS was about -3 to -4. The reddish blot is a wisp of cloud, and stars visible are in Gemini, with Castor and Pollux. The camera I used by the way is a new one, which I purchased last Sunday. It hence still needs to be calibrated. Like my previous camera it is a compact camera from the Canon Digital Ixus family again, but a newer improved model: the Canon Digital Ixus 75. It is a 7.1 megapixel camera (my older camera was 4.0 megapixel). Two recent finds of satellite fuel tanks - both of carbon-wrapped titanium fuel tanks from the Atlas Centaur upper stages of two US military satellite launches probably - are in the news at the same time. One came down a week ago in Brasil, the other was found in the autumn of 2007 in Australia. 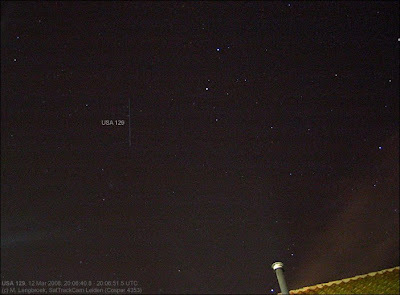 The Brasilian fuel tank is very likely part of the upper Centaur stage of the rocket that launched a US military communications satellite (Global SATCOM, 2007-046B) in October 2007. The Australian fuel tank could be a part of the upper Centaur stage of the rocket that launched another military satellite, USA 138 (1998-016A) in 1998. A late report on my observations of Wednesday evening 12 March. After a strong gale in daytime the sky cleared in the evening, although fields of clouds still came and went. A near first quarter moon in the sky was no real nuisance. 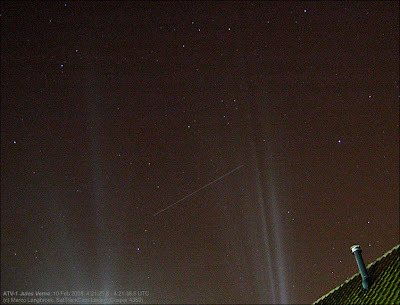 Several objects were observed: NOSS-es 2-3 and 3-4 and the NOSS 3-4 rocket, plus two KeyHoles: USA 129 and USA 186. 96-072A was 0.5s early, 05-042A 0.5s late, 07-027A on-time, 07-027C perhaps some 0.3s early (I might have been a tad "fast"with the stopwatch on this one though), and the rocket 07-027B was 1.6s late. The 96-029 C & D components were both 0.4s early, the E component 0.2s early. 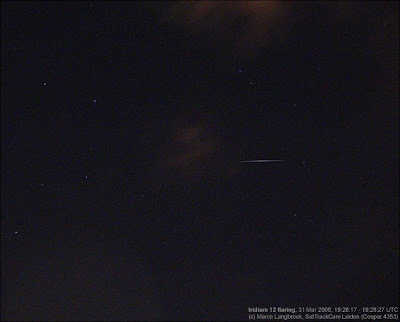 Yesterday evening (Saturday 15 March) the sky was too hazy to do serious satellite observations. I did shoot some nice moon images though. Below is an image of the craterland on the southern hemisphere (click it to see it at full screen, full resolution), plus a mosaic image constructed from 3 partial moon images. 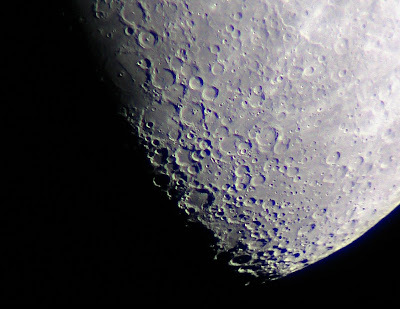 They were taken through my Meade ETX-70 with my Canon Digital Ixus 400 compact camera.